The juvenile court has appointed an independent welfare officer to monitor the investigation and questioning of the apprehended student. GURGAON: A Gurgaon juvenile court today sent the teenager apprehended by the CBI in connection with the killing of a seven-year-old boy in Ryan International School here to observation home till November 22. CBI sources said the court has fixed the next date hearing on November 22. Earlier in the day, the apprehended teenager, a class 11 student of the school, was taken by the Central Bureau of Investigation to the school to recreate the crime scene, they said. The sources said the team reached the school at around noon along with the accused and remained there for over three hours before taking him to the juvenile court where a hearing was scheduled. The team asked the teenager to explain the events that took on September 8 morning when Pradhuman, a class 2 student of the school, was allegedly killed by him, they said. He was asked to explain entire chain of events, even the smallest of the details, that unfolded on that day as the team took various measurements and recorded time, among others, needed to commit the crime as part of a corroborative exercise, they said, adding it was done to ascertain the claims of the accused. The sources said CBI officials also used a dummy in the form of a soft toy to ask him how he allegedly killed Pradhuman. Meanwhile, the father of teenager today alleged that the CBI was torturing his son which was strongly refuted by the agency. The sources said the juvenile court has appointed an independent welfare officer to monitor the investigation and questioning of the apprehended student. They said the officer, a completely independent entity, remains present during the questioning sessions and also whenever the accused is taken to a location. The sources said the agency is trying to analyse all aspects and possibilities in the murder case. Pradhuman was found near the toilet of Ryan International School with his throat slit on September 8 morning within an hour of his father leaving him at the school. 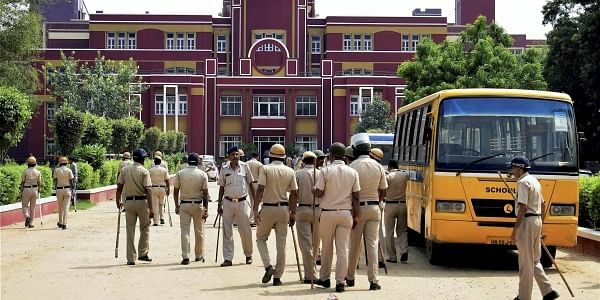 In a sensational twist to the case, the CBI recently announced that it had apprehended the senior student in connection with the murder of Pradhuman rejecting the Gurgaon Police theory that the killing was the handiwork of school bus conductor Ashok Kumar.